It’s ‘Good Divorce Week’ 26 -30 November 2018. What does this mean? Well, this week the professional family law community of Resolution – some 6500 members strong- are reaffirming their beliefs in a constructive and non-confrontational approach to supporting couples in marriage breakdown. FM Family Law would like to think that we approach every week as a good divorce week, but how great is it that the professional community are spreading the good work of Resolution family lawyers with these initiatives. Well, we will write about that another time. But it’s made us think about what actually makes a ‘good’ marriage? 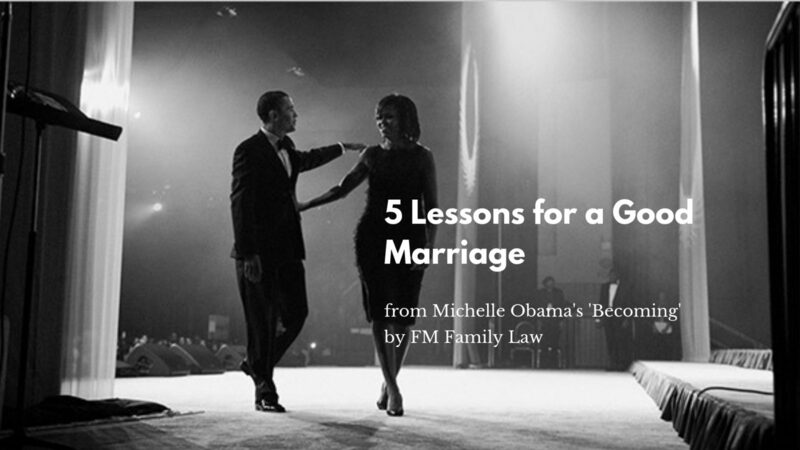 Our combined years as family lawyers have taught us many relationship lessons. Not just in terms of break ups: some of the most fulfilling cases we’ve worked on are those where couples have worked hard to address their differences and have come out of the other side, together, a bit bruised, but stronger. Michelle Obama’s Memoir ‘Becoming’ was released last week. 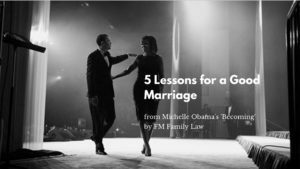 Through the perspective of a high profile, enduring marriage, we thought we would take a look at some relationship lessons. Many of us enter into a marriage with romantic preconceptions. ‘He/She will complete me’ and ‘We will share everything’. But in reality, nothing is shared down the middle; professional, family and romantic life is a balancing act, and we often neglect our own needs. Depending on your spouse for fulfillment is not sustainable: we need to instead look to them for support. Scientific studies have proven that having strong relationships outside the marriage increases the chances that the marriage will last. Simply put, making fewer emotional demands of a spouse strengthen a marriage. The happiest couples have interests and support ‘beyond the twosome’. ‘I needed the support’ she writes, but it didn’t necessarily need to be from her husband. In negotiating the spaces of personal ambition and family life, relationships outside of the marriage are a structural force helping to hold the central partnership together. In essence then the Obamas try not to ‘sweat the small stuff’ – giving each other a ‘hall pass’ for small indiscretions such as leaving laundry on the floor or occasionally being late for dinner. Instead they schedule time as a couple to have a good laugh. Despite scheduling challenges they took up a new hobby whilst at the White House – playing tennis together – and often joked at their mutual lack of skill. These kinds of activities can be an effective outlet for couples: you’re on opposing sides, but ultimately you have the same aim. Just like any other friendship, obstacles will beset a marriage, and finding the right outlet can give you a both a fresh perspective. At different stages of a marriage we are faced with hard decisions in prioritising whose needs come first. This is often the case when one of the party to the marriages faces a cross roads, such as taking a career break, or pressing pause on career progression, eg to bring up small children. There are currently an estimated 3 million people in the UK whose marriages are struggling. What lessons resonate with you if you’re facing a crisis in your marriage?